The NaturoPure HF380A from Heaven Fresh is a remote controlled, comprehensive and 'intelligent' air purifier to help against allergies and odours. We don't tend to think of the air in our home as being polluted, but there are endless types of chemicals and microbes that could be harmful to our health. Dust is a major air pollutant to which over 12 million of us are allergic in the UK, but mould, harmful gases, bacteria and viruses all fill our air and can have serious affects on our health without us even realising it. The most effective way to reduce the harmful pollutants in indoor air is to use an air purifier, which filters out the bad stuff and circulates fresh, pure air around your home. Heaven Fresh are a leading manufacturer of air purifiers, but their NaturoPure HF380A is one of their most sophisticated and intelligent units yet. This expertly designed and exclusive air purifier features unique sensor technology to automatically monitor and analyse the air quality around you. The advanced sensors can detect the presence of dust, allergens and odours and notify you of the air polution levels via a flashing LED light. This then allows the air purification levels to be set accordingly so that less energy can be used when polution levels are low. 1. Washable Pre-filter to prevent large particles from clogging the unit, for example hair and large dust particles. This filter is removeable and washable. 2. Electrostatically charged Plasma Array to magnetically trap tiny impurities such as dust mites, mould, pollen, pet fluff and micro dust particles. This can also be cleaned and is designed to extend the life of the following filters which are more complex. 3. Activated Carbon Filter to block harmful gases and odours such as cigarette smoke, formaldehydes and ammonia. 4. HEPA Filter traps 99.97% of pollutants such as small allergens, microscopic particles and the harmful particles in cigarette smoke. 5. TiO2 Photocatalyctic Oxidation Filter destroys bacteria, mould, viruses, odours, formaldehydes, ammonia and Volatile Organic Compounds which can be extremely harmful. 6. Ultra Violet Light works independently to neutralise micro organsims inclduing mould and viruses. 7. 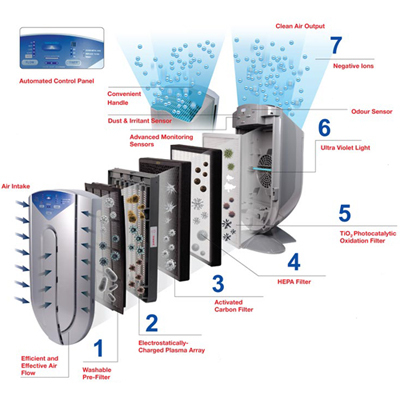 Ioniser distributes negative ions into the room to continue cleansing of the surrounding air. Having 7 different stages of purification ensures that as many toxins and pollutants are cleansed from the air as possible. The filters are easy to clean and last up to 2 years before they need replacing. The unit's 180 degree air intake allows you to place the unit behind furniture and out of sight if you wish without reducing air flow, and clean air is expelled upwards to allow the most effective circulation through the room. It also has a super quiet Silent Mode so that you can keep the purifier in your bedroom and enjoy a peaceful nights sleep breathing pure air. The NaturoPure HF 380A Air Purifier has an almost 100% success rate in clinical trials, and is FIVE times more efficient in toxin removal than other models. This new advance of the original HF 380 gives you the flexibility of controlling your unit via a remote for ease of use. Breathe pure air and stay healthy with the NaturoPure HF308 Air Purifier. Air purification, combat odours and allergies.